Size: 5.9" x 3.7" x 0.35"
Texas Instruments introduced in Europe with the TI-608 a small desktop calculator with a tiltable display. 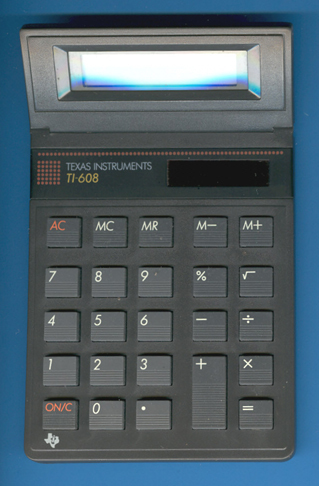 A similiar calculator was available with the TI-1797 in the United States of America. The design of the TI-608 followed the TI-606 introduced already in 1986. Dismantling the TI-608 reveals no surprises. A small single-chip calculator circuit probably manufactured by Sharp and a long flexible cable to the LC-display. Please notice that the mold of the housing is prepared for a battery instead of the solar cells. Don't miss the later TI-608 with a much smaller housing but still a tiltable display. © Joerg Woerner, November 15, 2005. No reprints without written permission.